Please note that the content of this book primarily consists of articles available from Wikipedia or other free sources online. 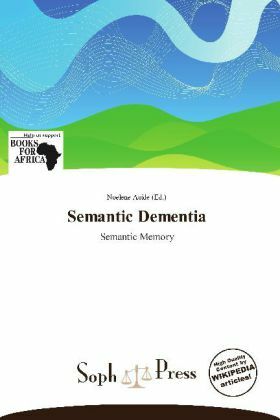 Semantic dementia (SD) is a progressive neurodegenerative disorder characterized by loss of semantic memory in both the verbal and non-verbal domains. The most common presenting symptoms are in the verbal domain however (with loss of word meaning) and it is therefore often characterized (incorrectly) as a primary language disorder (a so-called progressive fluent aphasia). SD is one of the three canonical clinical syndromes associated with frontotemporal lobar degeneration. SD is a clinically-defined syndrome, but is associated with predominantly temporal lobe atrophy (left greater than right) and hence is sometimes called temporal variant FTLD (tvFTLD).